Transferring from its successful run at the Almeida last year, Richard Eyre’s adaptation of Ghosts gives all impression of bursting on to the stage, but more truthfully edges in quietly from the wings and takes a little time to settle itself before delivering what may already be one of the performances of the year. Lesley Manville is exquisite as Helene Alving, arguably the most long-suffering of all Ibsen’s women. Consigned to life alone in her large house after a lifetime of managing her alcoholic and philandering husband’s reputation, Helene is a model of both composure and utter anguish. Manville is witty, forthright and completely heartbreaking as she tries to wrangle the remaining men in her life – her returning son Oswald (Jack Lowden) and first love Pastor Manders (Adam Kotz) – into some kind of order that might, at last, generate happiness. Tim Hatley’s clever set design renders the house at once both transparent and opaque; with the reflective walls allowing the characters to ghost around as Helene’s memories of her “university of suffering” with her husband return to haunt her in the form of her son. Highly controversial when it opened, not merely for its disregard for the morality and sanctity of marriage, Ghosts sits alongside Ibsen’s other work in feeling shockingly modern for its time of writing. Helene is a forward thinking business woman, a reader of feminist pamphlets; describing her marriage as the result of a balance sheet and completely fearless of doctrine in the belief that “God and the law [are] the cause of all the misery in the world.” Pastor Manders’ faith, in contrast, appears quite childlike and uneducated; his undeveloped sense of the world showcased as he rails against the abandonment of even the most unhappy of marriages, but is willing to let another take the blame for his own actions when convenient. Kotz masterfully handles what could easily be too pitiable and detestable a character. The truest spectre in the production is that of syphilis, contracted by Captain Alving and now afflicting Oswald; slowly killing him. Though congenital syphilis (passed from mother to child during pregnancy/birth) would be unlikely in this case, as symptoms manifest at a very young age, it is never fully clear whether he has become infected in this way or in adult life. Helene’s position is all the more agonising as she may have unknowingly passed it to him at birth, and she is faced with the impossible choice of assisting her son with his suicide or watching him waste away before her eyes. Both Manville and Lowden deliver a stunning finale, muted only by the rather frustrating decision to finish the performance in a crescendo of music, when trusting to their quiet delivery of such a poignant scene would have been far more affecting. From the moment Manville steps on stage, this production is elevated from good to stunning. A highly enjoyable cast, including the eminently promising Charlene McKenna, support what has not unjustly been called the performance of a lifetime. 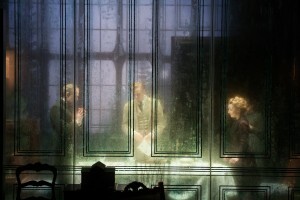 Ghosts is a firm reminder of why Ibsen holds his place as one of our most performed playwrights.